Anxiety in children is not a new phenomenon, but it is definitely gaining a new understanding from modern parents who are recognizing the signs much earlier. When you think about it, childhood is full of so many new experiences that it is completely normal for kids to have some trepidation. But if your child is exhibiting signs of truly anxious behavior, it might be time to learn some breathing techniques for anxiety, as well as some calming activities that will help them to cope through stressful situations. How Can I Tell If My Child Has Anxiety? Your best move if you think your child may have anxiety is to visit your pediatrician or a trained mental health professional to get a diagnosis. However, it can be helpful for you to understand exactly what the professionals are looking for when they examine your child. Some common signs of anxiety in kids include physical responses – like headaches or stomachaches that have no medical cause; emotional responses – like crying or getting overly upset about minor issues; thought responses – like worrying excessively for no reason; and behavioral responses – like acting out beyond what you might expect from a situation. Any of these signs once in a while is normal in children. They can come from a lack of sleep, hunger or stress. But if they are continual and do not get better over time, it’s worth having them evaluated. Anxiety isn’t a disease that can be cured easily. Instead, with anxiety, we try to manage symptoms and learn ways to cope. This is where breathing techniques for anxiety are so useful. Mindful breathing is one of the most calming activities for kids, as it allows them to be proactive in managing their anxiety. The goal is not to eliminate anxiety but to help the child self-manage it. Mindful breathing is a breathing technique for anxiety that teaches your child to slow down their breathing when feeling anxious or stressed out. When anxiety hits, a child’s breathing pattern will change. Often they will take short, fast, shallow breaths, which can even lead to hyperventilation and passing out. This type of breathing makes anxiety much worse. Mindful breathing helps your child to focus on their breathing technique to make anxiety better. Mindful breathing is the perfect tool because it is portable and can be used anywhere at any time your child needs it. This is especially important when you can’t be there with your child to help. How Do I Teach My Child Breathing Techniques for Anxiety? First, explain the concept of mindful breathing. Let them know that they can use this as a tool to control their anxiety any time and anywhere. Then, teach them the mindful breathing technique. While there are many variations you can choose from, the basic premise of mindful breathing is to take a slow breath in through the nose, hold the breath for a few seconds and then exhale slowly through the mouth. It should be repeated several times until the child is calm. Once they have mastered the basics, you can then encourage them to learn the different variations of mindful breathing. What Are the Different Breathing Techniques for Anxiety? There are many examples of mindful breathing you can look up online, but here are some of the favorites that are suitable for younger children and all the way up into their teenage years. The Bubble Blowing Technique is one of the best for very young children, as it allows them to learn through play. To make it work, give them a small toy soap bubble container and wand to practice blowing bubbles. They will learn quickly that if they blow too hard or too fast, the bubble will burst before it has time to take shape. But by blowing slowly and with purpose, they can blow a perfect bubble. Have them practice the technique with real bubbles before removing the soap and letting them use only their imaginations. The Belly Breathing Exercise is another good one that requires imagination. Using the basic mindful breathing technique described above, have your child take in deep breaths through their nose, while imagining that there is a balloon in their stomach. Their belly should inflate as they breathe in and deflate as they breathe out. This is a good one for waking up a sluggish child. Have them stand with their feet shoulder-width apart, arms dangling in front of them like an elephant’s trunk. As they take a deep breath in through their nose, have them raise their arms high above their head like an elephant raising its face. As they breathe out through the mouth, the arms can go back down. Repeat a few times to get them laughing. This is a well-known breathing technique for those who have done yoga. It involves sitting comfortably on the floor with legs crossed. Have the child close their eyes, place their fingers in their ears, breathe in slowly through the nose and then hum out the exhalation. This is a very comforting and calming technique that kids often really enjoy. Flower breaths are as simple as telling your child to imagine smelling a beautiful flower. Breathe in the scent through their nose and release it through their mouth. They can practice this as you are out and about by stopping to smell the different flowers they see. Similar to the Bumble Bee Breaths, Hissing Breath involves breathing in through the nose and releasing the breath with a long hissing sound through the mouth. Teach kids to try and let the hissing last as long as they can, as the longer it lasts the better they are controlling their breathing. This is a great one for just before nap time or any activity that requires calm. The child should imagine a bear hibernating. The idea is to be restful and almost lazy. Breathe in for four seconds, pause for two seconds and breathe out for four seconds. Pause for two seconds and repeat. Bunny Breaths are often a favorite for kids, as they just love the idea of pretending to be little bunnies. It involves three quick sniffs through the nose and one long exhale through the nose. Kids can choose to act like bunnies, hopping around, sniffing the air, looking for carrots or even burrowing into the ground. This is a great one for when a child is extremely upset and starting to hyperventilate. If they have practiced it enough in a fun way, when it comes time to use it, they will find it very helpful. Have your child sit on the floor with legs crossed, cupping hands around their mouth. Have them take a deep breath in through the nose and then slowly blow out through the mouth, moving hands and arms outward with the exhale as if blowing up a hot air balloon. Once the balloon is as big as they can make it, have them breathe normally, swaying side to side as they watch the hot air balloon fly high. The exhale on this breathing technique is very relaxing for children and makes great use of their imaginations. Have your child place their hands under their chin, interlacing fingers. As they inhale, have them lift their elbows upward around their head, and as they exhale, have them lift their heads up and give a whispered roar into the sky, pretending to be a dragon breathing fire. As they exhale, their arms should fall down toward their sides ones more. 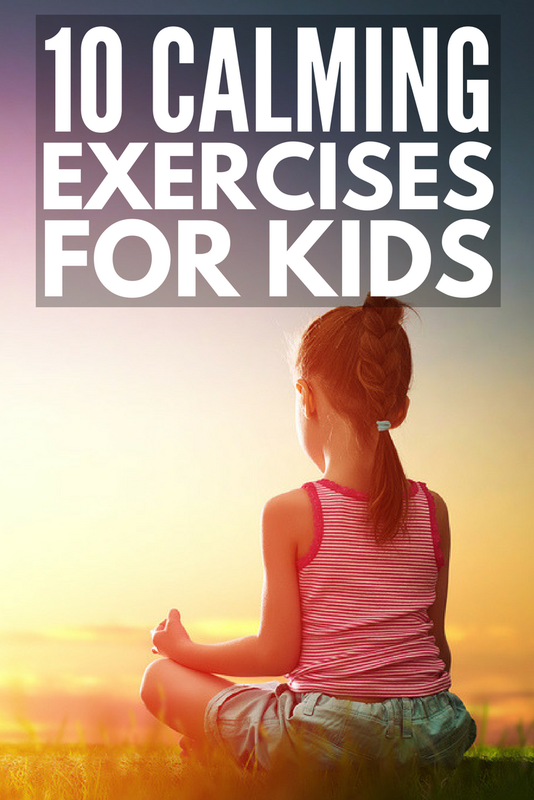 This is great for raising energy, and it’s perfect for when a child feels nervous or scared. There are many games and toys you can try out with children to help them learn these breathing techniques for anxiety. Besides the aforementioned bubbles, you can also try giving your child a small pinwheel to blow as they practice each breathing type. Not only will it help them to learn the techniques, but it has an added bonus of giving them something to focus on to help calm down. Another great toy for them is a hoberman sphere, which is perfect for the belly breathing and the hot air balloon. It helps them to visualize filling something up, as they open the sphere. The bright colors may also help to cheer them up! Having easy calming activities for kids on hand will give you to tools you need to help your child through any issues they may face due to their anxiety. If you found these breathing techniques for anxiety helpful, please share this post on Pinterest! And if you’re looking for more parenting tips and tricks, please follow our Parenting board where we share all kind of fabulous ideas!